When teabagging goes horribly wrong? Pretty good article discussing recruits expected to be at the game this weekend as well as the barn game in a couple weeks. November 12, 1892 – Most die-hard University of Alabama football fans have heard about the team’s first game, on Nov. 11, 1892. The Cadets (“Crimson Tide” came later) beat an all-star team of Birmingham high school students 56-0. But how about that crazy second game, played the following day? It took place at old Lakeview Park in Birmingham, against a team put together by the Birmingham Athletic Club (BAC). At that time a touchdown earned four points, the extra point was worth two points and a field goal was a whopping five points. Alabama scored first and held its one-touchdown lead until the final minutes. Unfortunately for the Cadets, it all came down to a field goal. The kicker was BAC founder Joseph Ross, an Irish-born rugby lover. His drop-kick went 63 yards for the win – and Alabama’s first loss. If it’s any consolation, a rematch took place the following month. The Cadets won 14-0, on three touchdowns plus an extra point, er, two points. See, y'all run Boz off, so now we got no idea about injuries to Damien, Deionte, and Leatherwood. Damn. As far as I know, Boz and I have no beef. I haven't read any of his posts since he left, but it sounds like his 15-minutes might be flaming out. His insight on the Birmingham Iron should be outstanding, though. Harris has what they’re calling a mild concussion, and the reason they were checking him out was they were checking his neck, which seems to be OK. Will likely sit out the Iron bowl or he may not. Thompson has a bruised knee, which doesn’t seem to be a significant injury. Probably could’ve put him back in the game but just didn’t do it. How was your conversation with Papa Tua this week? Honest question, what the hell is up with tuas knee? He looked fine this week, like nothing was wrong. How in a weeks time do you go from looking injured to fine? 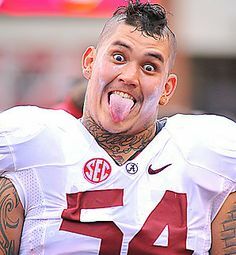 Wouldn’t it be funny if he really had it scoped and the citadel game was a fully recovered tua. I only get to talk to him after the games.Last we spoke he said Tua was having a full knee and hip replacement surgery (hip just as a precaution) the night before the Iron Bowl. I mean, he said that Tua's knee and knee was still bothering him, so I can only assume that's what the doctors will do.. He should be good to go for the game. Last edited by Big Balls; 11-19-2018, 11:27 AM.